Tim hails from the outer suburbs of Chicago, IL where he went to school for Recording Engineering at Tribeca Flashpoint Academy. He is passionate about music but realized that the industry wasn’t what he was looking for at this time and decided to move west and try his hand at his other passion: the outdoors. Moving to Colorado in 2014, he found himself working the lifts at Eldora Mountain Resort in Nederland, CO and began realizing that being outside was truly where he wanted to be. Although, through many different seasonal jobs including lift operator, snow maker, arborist, and landscaper, Tim came to feel a lack of stability within his work life and decided to take another leap west to Salt Lake City where he found steady, year round work with a contractor who taught him the true craft of building and design. Tim loved the carpentry work for the challenges it provided and the accomplished feeling of hard work that helped create a special environment for clients. The only problem was the lack of time he got to spend being outdoors and eventually the tables turned and he decided to make a change. 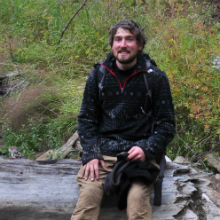 After much thought, he made the decision to try something new yet again and having gotten to know several employees from Elements Wilderness Program, he thought that it would be a great fit and possibly combine his love for the outdoors with that feeling of helping people. Tim has been with us since September of 2018 and has grown a passion for the work. On his down time, he can be found snowboarding through the trees or singing songs around the campfire with his friends. Elements is an intermediate outdoor behavioral health program. Since 2008, Elements Wilderness Program has provided a specialized therapeutic intervention for adolescent boys aged 13-17. Elements prides itself in its ability to strike the best possible balance between evidence-based therapy and hands-on and fun experiential activity. We believe that the wilderness provides the best environment for our students and their families to drop their defenses and truly discover a path forward.